In contrast to my earlier album, Soulweaver, where I explored the complexities of instrumental harmonies and vocals, Liquid Cello is an invitation to experience the depths of single melodic movements. My yoga lessons inspired me to create this CD. I felt encouraged to create a suitable ambience with the cello – a music which allows you to relax and at the same time keeps you present. The cello reaches depths way below the human voice and can peak high above it. Its sound combines strength with fragility and brings together earth and sky into one fluid experience. In fact, its depth of experience is often misunderstood as melancholy and sadness. This work is dedicated to our oceans and rivers and all the beings that live in them and through them… and to Osho, whose name means ‘oceanic’. Soothing cello solos opening into a deeper spectrum of emotion. Each stroke of the bow forms ripples on a quiet silver lake. Download from cdbaby and itunes. 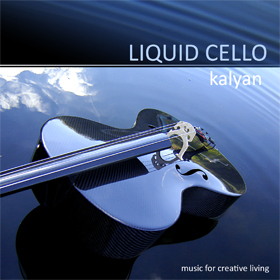 I was very surprised by the quality of the sound on CD ‘Liquid Cello’ – the cello comes out magnificently. And this space you inhabit to sustain execution of musics is quite unique: it leaves no choice than to stop.